Dynamic Bicycles, Inc. today introduced the Synergy - the world's first drop bar road bike using a Shimano internal gear hub. Unlike any other road bike on the market, The Synergy combines Shimano's Alfine 8-speed hub with the new Versa integrated shift-brake lever to create a lightweight bicycle that delivers the performance of a road bike with the inherent simplicity of internal gearing. Demand for Shimano internal gear hubs has been steadily rising the last few years. However, until now, internally geared bicycles have been limited to using flat or upright handlebars. The Synergy changes all this. With its drop bar design, it takes internally geared bicycles to a whole new level of performance and versatility. Patrick Perugini, president of Dynamic Bicycles comments, "There is currently no other bike like the Synergy on the market, and no bike has ever offered this level of performance using an internal gear hub. The Synergy offers fast, smooth shifting across a wide gear range, and very low maintenance. But most importantly, it's a lot of fun to ride. It is an ideal bike for fitness riding, event rides or fast commuting." The Synergy recently received glowing reviews from both BikeCommuters.com and BikeHugger.com. Jack Sweeney of BikeCommuters.com wrote, "The Synergy blends STI-style shifting and an internal gear hub into a sleek, road-worthy package that is capable of some real performance." Mark Villegas of BikeHugger commented, "The Synergy is an honest performer, and I really think that this bike could be a hit." With Shimano's internal gearing, all the gears are tucked away inside the hub of the rear wheel, giving the bike an attractive, minimalist appearance, similar to a single speed or track-style bicycle. Using the Shimano 8-speed Alfine hub Shimano's most efficient internal hub - the Synergy offers a gear range equal to 95 percent of a compact double crankset, and 92 percent of a full triple crankset. To control the shifting, the Synergy uses the new Versa integrated shift-brake lever, the first drop bar road lever developed specifically for the Shimano hubs. The benefits of the Synergy's internal gearing design are tremendous. Wither fewer external moving parts, the Synergy dramatically reduces maintenance and repair costs. It also simplifies shifting with a single shifter controlling the eight evenly spaced gears for smooth, consistent shifts that can be made at any time - while pedaling, coasting, or even at a complete stop. The Synergy weighs just 20 pounds, making it the lightest weight internally geared bike on the market today. 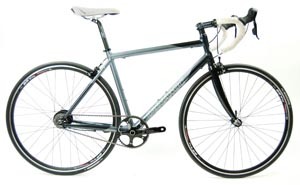 It uses a 7005 Alloy frame, carbon fork and many high end components at a retail price of $1,399. The Synergy is available online direct from Dynamic Bicycles and through select retailers. Retailers interested in carrying the Dynamic Synergy can call 1-800-935-9553 for details. For more information on Dynamic Bicycles and its line of innovative bicycles, go to www.dynamicbicycles.com.